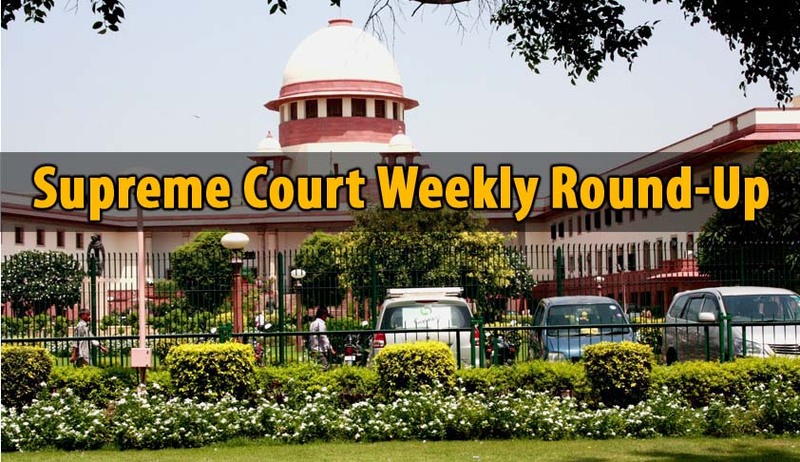 The Apex court quashed the criminal proceedings against Indian Council for Medical Research (ICMR) Officials, who were allegedly involved in unauthorized and illegal transfer of some property. Apex Court bench comprising of Justices V. GopalaGowda and Amitava Roy held that the alleged offences were committed by them in discharge of their official duty, and therefore, previous sanction from the Central Government under Section 197 of CrPC was required to be taken , before summoning the accused. Supreme Court of India bench of Justices Dipak Misra and Prafulla C. Pant held that only because a decree of Judicial separation is passed, a wife does not cease to be an ‘aggrieved person’ for the purpose of Domestic Violence Act. Supreme Court directed the Uttar Pradesh Government to pay Ten Lakh Rupees to a Retired IFS officer as compensation for making him spend about 11 days in jail and fight a decade long legal battle against the state, even when there were no proved charges of corruption against him. Apex Court bench of Justices RanjanGogoi and N.V. Ramana allowing the petition, observed that no material in support of allegations levelled against the petitioner has been made available by the state. Supreme Court allowed Intervening applications pertaining to stray dog issue and has requested the High Courts across the country, not to pass any order relating to the Prevention of Cruelty to Animals, 1960 Act and the 2001 Rules pertaining to dogs. The court also has asked all the Local Self Government bodies and Animal welfare Board to file affidavits regarding the issue. In a surprising move, the toll levy contractor SMYR consortium on Monday appeared before Supreme Court and expressed inability to make the collection of environment compensation charge imposed by the apex court on polluting commercial vehicles entering Delhi citing several problems including financial loss. The Supreme Court slammed the Indian Navy for gender discrimination, unreasonable classification and strongly favoured permanent commission for women officers in all wings after they complete their short service commission. A Supreme Court bench headed by Justice Khehar has issued notice to Goa Government and all mining companies in Goa on a Public Interest Litigation filed through Advocate PrashantBhushan. The PIL challenges the en masse renewal of mining leases in the State of Goa declared “expired” by the Supreme Court. The Bench directed the respondents to file their replies by December 1 and has listed the matter for final hearing on December 9. In a major embarrassment to Madhya Pradesh Governor Ram NareshYadav, the Supreme Court has issued notice to him, state government and the Centre on a plea seeking his removal for his alleged involvement in the sensational Vyapam scam.